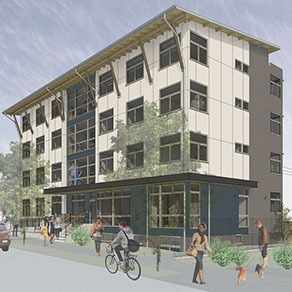 Welcome to the Yobi, a Seattle University housing community. The Yobi encourages community through an innovative design emphasizing social interaction. 1/3 of the energy of someone living in a conventionally designed apartment building. Residents are welcomed home at the ground floor by a generous commons featuring a lounge, fireplace, kitchen, study room, laundry, mailboxes, and media room. Access to the private rooms is through the commons, activating the space and creating opportunity for chance encounters among the residents. 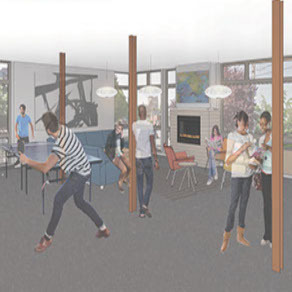 The commons provides a public counterpart to the private units, a place to bring people together for movie night, weekend dinners, study groups, etc. Built Green 4 Star, Yobi has met sustainable criteria over a broad range of categories including; storm-water management, water use, energy use, indoor air quality, and waste reduction. Energy saving features include a high performance exterior envelope, spray foam insulation, passive solar design, high efficiency lighting, and high efficiency gas boilers. All together, the project has an energy use budget that is 60% of what is required under the current energy code. 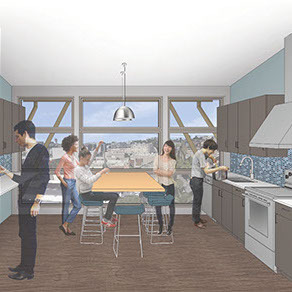 Each level has what we’ve dubbed a “pajama commons”—a communal kitchen where immediate neighbors can cook together and hang out in a more casual setting. Communal spaces look out onto the street, providing positive “eyes on the street,” as well as visual activity along the street edge.